What just happened here? That’s the question that everyone is asking right now. It’s no surprise to see Eli Tomac win, we expected him to win some races this season, but nobody expected him to beat Ryan Dungey in the second moto by a minute and a half. Yes, he beat Dungey by a minute and a half. Say that out loud and try not to let your jaw gape. Clearly, things are working perfectly for Tomac, who lapped through ninth place. Behind him Dungey rode to a lonely second, with Barcia holding down third almost the entire race before getting caught and passed by a charging Weston Peick. Ken Roczen rebounded to take fifth in this one, and afterward admitted he’s dealing with a stress fracture at the bottom of his spine, and has been on the couch for the last ten days. Blake Baggett beat out Jason Anderson for sixth, but Anderson edged him for the final podium spot. 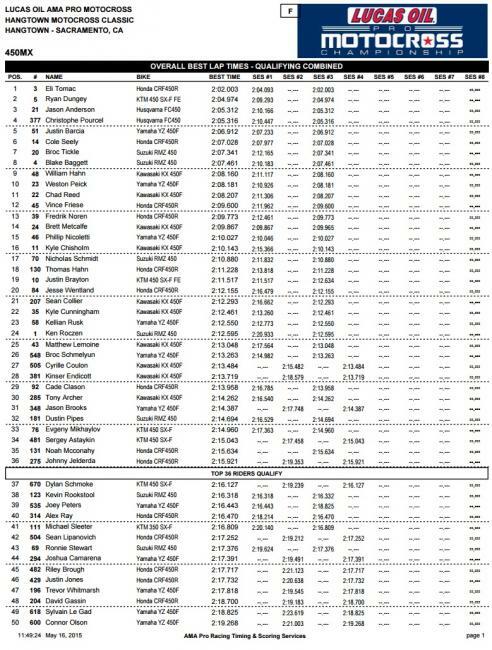 Baggett ended up with fifth overall behind Peick. Things weren’t good for Cole Seely, who crashed out of the first moto and didn’t race the second. There’s a good chance he’ll be back for Glen Helen next week. This moto was a bit of a snooze compared to the first—Cooper Webb pulled out early after hurting his ankle and Jeremy Martin took over the lead on the first lap and checked out. 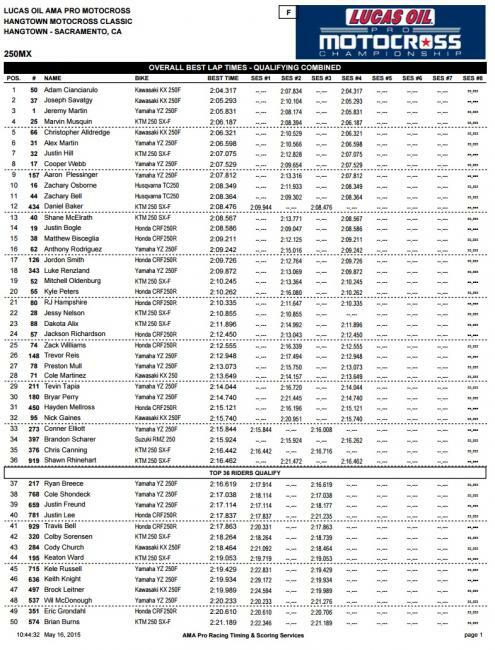 Marvin Musquin started around tenth, but by the time he got up to second he had absolutely no chance of catching Martin. Jessy Nelson had a great ride going, holding down second, but he ended up going down twice. One of the crashes happened when he got together with Justin Bogle, with Bogle getting the worst of it and leaving the track sitting in the Asterisk Medical Mule. Chris Alldredge had an absolutely amazing race. He started great and held down third by himself for much of the race. Then, with a few laps remaining, Alex Martin and a very hard-charging Zach Osborne caught him and really started applying pressure. Alldredge held them at bay though to take third, followed by Martin and Osborne. 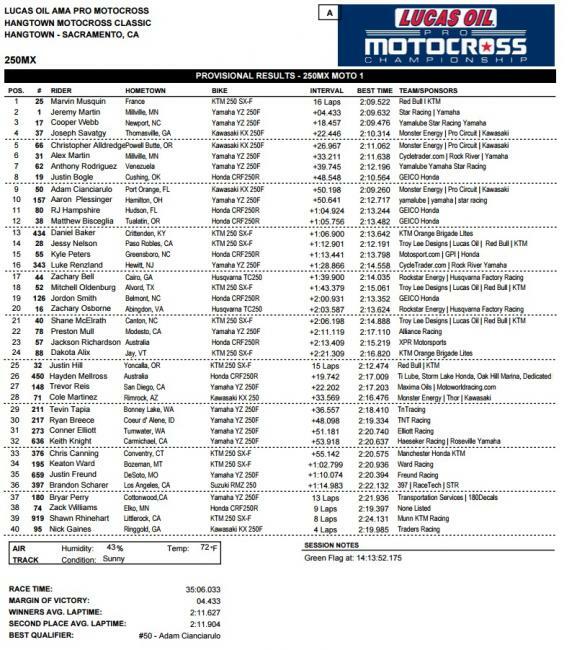 Eli Tomac may not be the best starter in the sport, but when he gets a good one he’s extremely dangerous, as evidenced by his wire-to-wire trouncing of the field in the first 450 moto of the year. 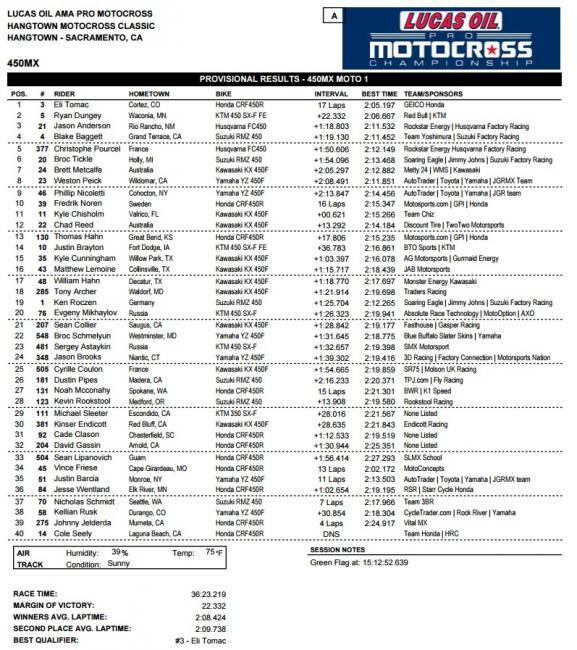 Ryan Dungey did his best to keep him honest, but Tomac steadily put small amounts of time on Dungey the entire race, finishing 22 seconds ahead of the Red Bull KTM rider, who finished almost a minute ahead of Jason Anderson in third. That’s not a typo either. Tomac was going so fast he lapped all the way through tenth place! One of the more entertaining parts of the race came with Tomac skied the Fly 150 step-up triple on the first lap. Without hesitation, Dungey pulled the trigger on it right behind him, and the crowd roared their approval. Behind the lead duo was Weston Peick, who had a good race going early but faded, eventually finishing eighth. Last year we would have been touting Peick as having a fantastic race with an eighth, but he’s improved so much in that time it’s no longer a monumental achievement for him. The racing got pretty spread out in the second half, and there just weren’t a whole lot of battles going on. Cole Seely is listed with a DNS, but that’s not true—he crashed and pulled out before completing any laps. 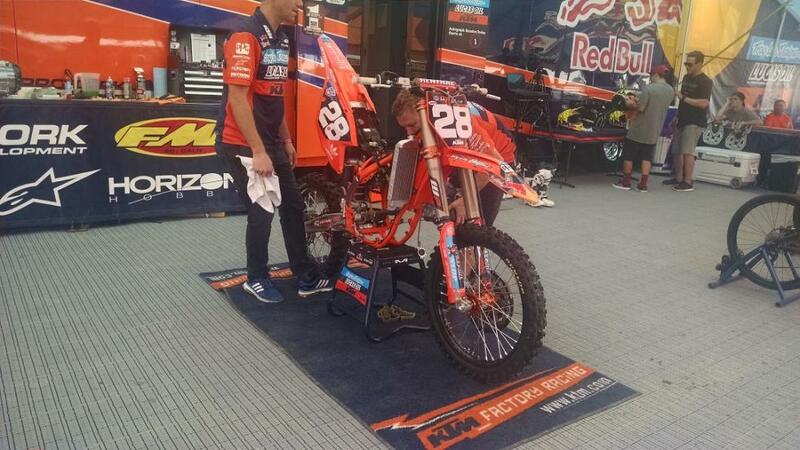 Ken Roczen, who is nursing a back injury, finished nineteenth. What a race! Justin Bogle charged out to the early lead, but after a few laps Adam Cianciarulo took over the lead as the two exited the half pipe feature. Bogle tried to fight back, but he ended up eventually tossing out the anchor and finishing eighth. Cooper Webb, meanwhile, had gone around Marvin Musquin and started applying major pressure on Cianciarulo, who must have felt the heat because he responded by launching the Fly 150 step-up triple. It was massive and the crowd erupted. Unfortunately he went down all by himself a few laps later. Cianciarulo appeared to have something wrong with his goggles after the crash, and he spent several long moments fiddling with his goggle area before rejoining the race. He came back to ninth. Not sure when it happened, but Webb found himself without goggles early on in this one, which likely slowed his pace and allowed Marvin Musquin to disappear with the lead. Jeremy Martin seemed to struggle a little bit in the first part of the race, giving up some spots early, but he really caught fire in the closing stages of the race. After catching and passing Webb for second, he gapped him immediately and started closing on Musquin. Had there been another two laps, we may have seen a spectacular battle for the moto win between the reigning champ and the Frenchman who would be king. Qualifying is all wrapped up here at Hangtown, and Eli Tomac has fired the first shot in qualifying. 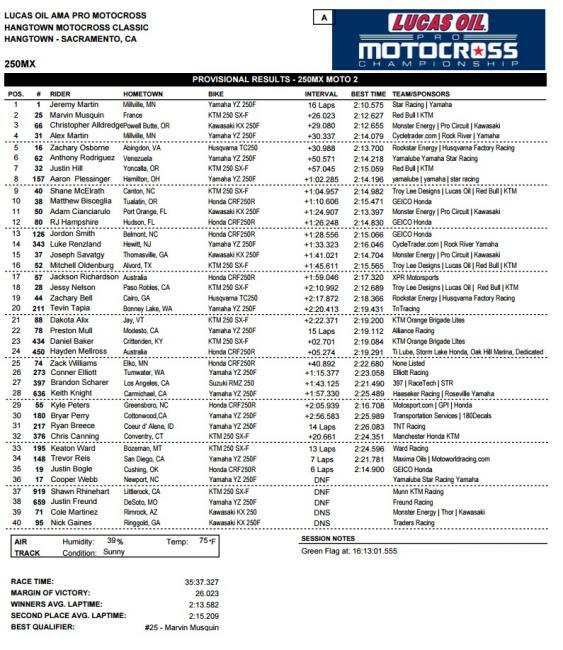 After besting the closest racers in the first session by over three seconds, he once again topped the field in the second, this time by nearly three seconds over Ryan Dungey. Tomac is packing so much speed out there he probably had to check extra luggage on his flight in. Elsewhere, whatever was bothering Ken Roczen (word is it’s a back injury and he hasn’t ridden for several days) in the first session stuck around for the second—the RCH Suzuki Jimmy John’s rider was 23rd fastest. He would put in short spurts of speed, but he never went all out for an entire lap. With lap times like this, his name will come up in plenty of conversations after the race, but not the ones he wants. Hey, at least he doesn’t have to race the consolation race (LCQ)! In 250 action it was all green up front. Joey Savatgy was extremely fast, but Adam Cianciarulo threw in a heater at the very end to take the top spot. Jessy Nelson’s qualifier was cut short when a mechanical problem popped up. The issue was severe enough that it required a motor swap. Definitely not what his mechanic, Jordan Troxell, wanted to do, but not a big deal for some of the sport’s best techs. All in a day's work for these guys. In other news, Josh Grant is out after a big crash left him with a lacerated tongue and extreme soreness. The track itself looks good, and is the same basic layout as usual with a few noteworthy changes. There’s a cool downhill double, a half-pipe a few turns before the finish line that could present some interesting passing opportunities, and a new step-up triple called the Fly 150. As the name suggests, it’s 150 feet in length, and nobody launched it in the first round of qualifiers. It's a great day for racing here in Northern California. The morning air is cool and the sun is out, drying up the remnants of the rain that fell on Thursday. Lots of things to look forward to today. Will Ryan Dungey’s incredible season of Monster Energy Supercross continue in motocross? How will his Red Bull KTM teammate Marvin Musquin do against Yamalube Star Racing Yamaha’s Jeremy Martin and his number one plate? Has Cooper Webb’s high ankle sprain from Las Vegas healed well enough to go hard for thirty plus two? And speaking of ankle injuries, what about Ken Roczen’s injured ankle/foot that took him out of supercross early? Can Eli Tomac channel his raw, blazing speed into consistent podium finishes, or will he find himself buried off the gate? Then there’s Christophe Pourcel, who is making his debut with the Rockstar Husqvarna Factory Racing team in the 450 Class. Will he podium? Holeshot and fade? Pull off the track early? Nobody knows! The questions literally do not end. 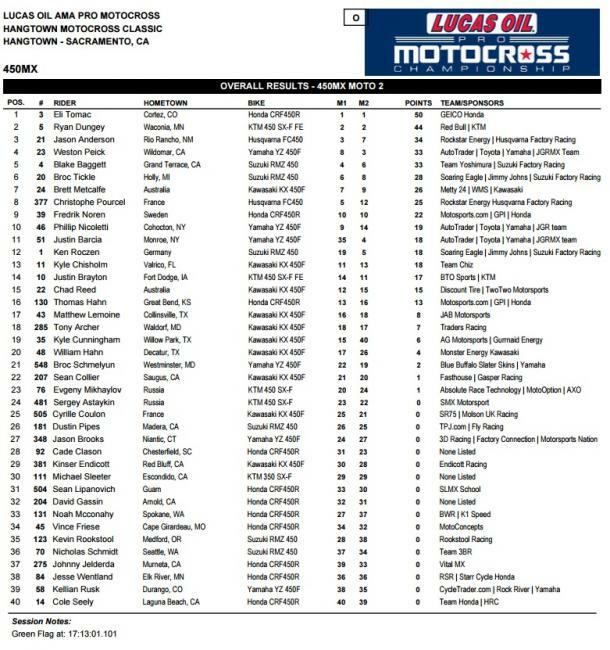 Justin Bogle, Weston Peick, Brett Metcalfe, Zach Osborne, Adam Cianciarulo, Joey Savatgy, Justin Hill, RJ Hampshire, Jordon Smith, Cole Seely, Kyle Cunningham, Matt Lemoine, Chad Reed, Blake Baggett, Jason Anderson, Zach Bell, Wil Hahn, Chris Alldredge, Alex Martin, Jessy Nelson, Aaron Plessinger—every name you can think of has some sort of storyline attached! Grab a cold drink and find a comfortable spot on the couch because you're not going to want to do anything else but keep track of the action from the season opener!